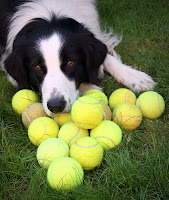 The other day as I sat cross-legged on the floor in my study, eyes closed, hands open and relaxed, a tennis ball dropped into one of my palms. Enough of stillness! My dog Joey was ready to play. I smiled—but I kept my eyes closed and let the ball simply rest there in my hand as I went back to silently repeating the “sacred word” I use in centering prayer. Holy God¸ breathing in. Holy God, breathing out. Joey was undeterred. He picked up the ball—and then dropped it back into my palm. Again I kept my eyes closed and remained still. Holy God, breathing in. Holy God, breathing out. And then Joey did something he almost never does in the house. He barked. Which is how he got me to get up and go outdoors and play fetch with him that day. Time spent in contemplation is good. Any quieting time that allows the still small voice of calm, the whisper of God, to be heard through the noise of daily living is good. But the point of it that quiet time is not to stay there indefinitely. Rather, we let the quiet prepare us to be called more fully into the world—to vote, for example, or to be a poll watcher; to give blood, or to serve a meal at a shelter; to do our day job or our weekend volunteer work; to sit with a suffering friend or to help strangers pick up the pieces of lives torn apart by a hurricane-turned-superstorm. Moments of quiet can make us ready to receive whatever gets dropped into our palms. On days when we are lucky, what gets dropped is a tennis ball and we can go outdoors to play, rejoicing in the goodness of creation. But even on days when the call is to a difficult task, we can keep on breathing with the words we repeat during moments of quiet. Holy God, breathing in. Holy God, breathing out. We can open ourselves to what calls us, one centered breath at a time. What’s being dropped into your palm this week? What sacred words have meaning for you? Some words I have heard from others include “Love,” “Trust,” “Peace,” “Amen,” “Maranatha,” and “Abide.” As you respond to whatever is calling you, may you find sacred words to carry with you—words that keep you strong, clear, and centered in the love of God as you breathe them in and out. I love this! What a great way to express our stillness is always needed, even in times where there is movement. Beautiful. And this week, I just posted my words of stillness and gratitude "the newness of being," thinking of babies, new life, motherhood and joy.